Southwestern bathroom fixtures give your home that warm, rustic feel that makes everyone feel relaxed and instantly at-ease. All designs are available in a 26 inch towel bar, towel rings, towel hooks and toilet paper holders. (Shown above: Zuni towel ring). Each piece comes with matching screws for mounting to the wall. Pieces are made of 12 gauge steel (where the insert mounts to the wall) and clear-coated to protect the finish. Bars are made from square stock (3/8 inch x 3/8 inch). Each piece is made and finished by an artist. Slight variations in finish may occur. 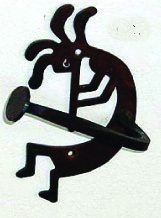 Southwestern bathroom fixtures are cut from steel and finished by an artist. Also available in Matrix which is shown on the Aztec towel bar above. Please note: finishes may vary somewhat. Order your made-to-order southwestern bathroom towel rods and fixtures today.